Solar As Cheap As Coal… Why Not Cheaper? We’ve been following 1366 Technologies around since 2008, and it’s set to deliver big time on its promise of low-cost solar. 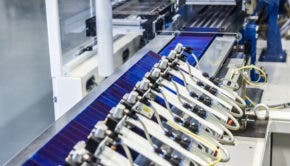 The company has just announced that it is pairing its souped-up silicon wafers with solar powerhouse Hanwha Q Cells in a partnership that will “dramatically” reduce the cost of manufacturing solar cells. Hanwha Q Cells has also been involved in a series of moves culminating in a merger with Hanwha SolarOne, aimed at locking in the brand’s position as biggest solar cell manufacturer in the world. 1366 already has sights on solar “at the cost of coal” but we’re thinking that it could go much, much lower, except for one little problem. If you guessed that problem has something to do with soft costs, you’d be right. Here in the US, the cost of a solar cell — the hard cost — is less than half the total installed cost of a typical solar array. The rest is all the soft stuff, including permitting, installation, inspection, and grid connection. That creates a long bottleneck, to the tune of 180 days or even more according to the Energy Department. When you think about it, why should rooftop solar be any more complicated than any other major consumer purchase? One of our commenters pointed out yesterday that buying a car is a far less cumbersome process than buying rooftop solar, and we’ll just add the point that cars are way more dangerous than your typical rooftop solar array. Well, the Energy Department has been working on that, through the SunShot initiative. Just yesterday we took note of the Energy Department’s new 7-Day Solar competition, which is designed to slough away all the gunk and make rooftop solar just as easy as buying a new home furnace. Another recent SunShot program is the new “Solar Hackathon,” which is aiming to crowdsource new software to help make solar ownership cheaper and easier. That’s just two examples from a honking huge low-cost solar toolkit that the Obama Administration has been quietly assembling over the past six years, so if you want to see more, go on over to the SunShot website and take a look. We Built This Low-Cost Solar! The Energy Department has also been a big supporter of 1366, so before we go anywhere else, let’s all pause for a group taxpayer hug. The Direct Wafer™ process holds the promise of producing approximately 700- to 1,000 megawatts (MW) of silicon-based wafers annually, reducing manufacturing costs by 50% and thereby significantly enhancing the competitiveness of a US company to compete globally against countries whose governments are aggressively supporting solar power industry development. The manufacturing process eliminates a huge amount of waste, which contributes to 1366’s low-cost solar strategy. Also playing a role is the company’s focus on a drop-solution that is compatible with the existing solar supply chain. The science is understood. The material is abundant. The products work. All that is left is to build the largest manufacturing industry in the history of mankind. This is what we intend to do. So, that’s why we’re thinking that solar won’t just meet coal on price, solar will beat coal. After all, there’s only so much “easy” coal left in the world, but solar manufacturing sites are practically limitless. By the way, if you’d like to see another example of taxpayer-funded low-cost solar cell manufacturing, check out a nifty little video of a new perovskite-based process under way at Los Alamos National Laboratory. Image credit (screenshot): Courtesy of 1366 Technologies.